If you’re reading this and raising your eyebrows, you’ve never had, what I like to call, the “grade discussion.” I don’t mean the discussion between high school or college students who are comparing grades after a big mid-term or final exam (although I used to do that too). I mean the discussion over the solvent grade you use in your laboratory. When you look at the chemicals that are used in most laboratories, they can be classified into one of seven different grades. Those grades (in order of purity) are: ACS, Reagent, USP, NF, Laboratory, Purified and Technical. If you are reading this and are interested in environmental applications you probably only use ACS or Reagent grade solvents and chemicals. If your lab performs analyses in other application areas, things get a little more complicated. Where some applications are flexible about the solvent grade you use, others are more strict. Do you know what your solvent grade requirements are? Let me see if I can help. ACS and Reagent grade are usually about equal in quality. The major difference between these two chemicals is ACS grade solvents must be tested to ensure that their purity meets or exceeds the standards that have been set by the American Chemical Society (ACS). An example of these standards is listed here for acetone (others are accessible if you are an ACS member). 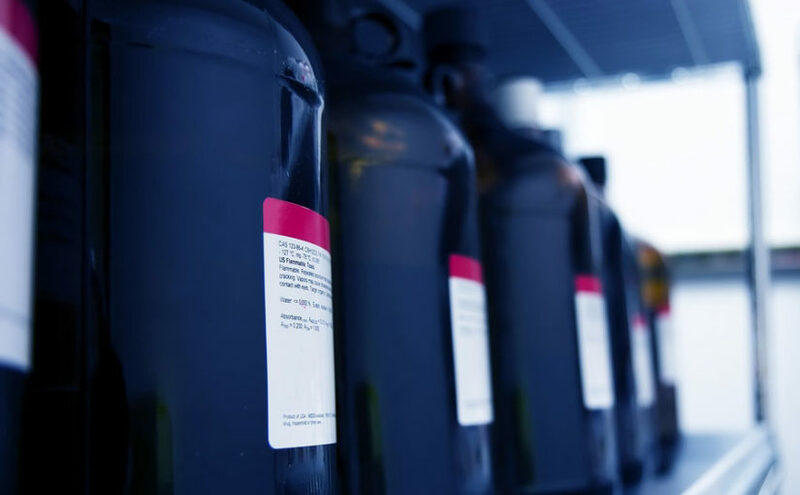 Once you get past the industry solvent grade, you’ll probably notice an additional grade, set by the solvent supplier. Each supplier has its own grades for chemical reagents and solvents, based on their intended application use. Some examples of these are HPLC, GC, LC/MS, and pesticide grade solvents. HPLC grade solvents are specifically tested for their UV absorbance. They get filtered with sub-micron sized filters and are put through a variety of experiments to qualify it as being HPLC grade. LC/MS grade solvents are tested the same way as HPLC solvents, with an additional test to determine whether it contains metals which could form adducts if used for LC/MS applications. GC grade solvents are tested to ensure they are free from GC contaminants. Pesticide grade solvents are, as you can probably guess, tested to make sure they don’t contain residual pesticides. Conveniently, EPA methods usually provide guidance in terms of choosing the correct solvent. Most methods will go so far as to recommend an example supplier and grade for each chemical that must be used. For example, EPA method 525.2 specifically calls out the use of solvents with a purity of pesticide grade or higher. While helpful, that guidance doesn’t always work out. I recently had my pesticide grade of ethyl acetate go on backorder for more than a month. After contacting the vendor and getting the specs for a higher solvent grade, I had a case of ethyl acetate in less than a week for a lower price. I saved myself some money, and I could continue doing solid phase extraction work without any interruption. So my grade recently went up. What is your grade?